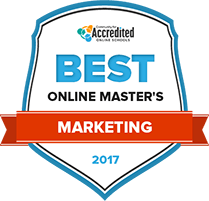 Earning an online master's in marketing is one way individuals can dive deeper into the marketing field. These programs often provide intense courses that can help prepare students to move into higher levels of responsibility, such as leadership or management positions. Some students may even choose to use the online master's program as a stepping stone to beginning a new career path. No matter what the end goal may be, earning an online master's degree in marketing can help enhance an individual's opportunities for career growth. Find more information on potential programs, timelines, and possible career paths for master's degree in marketing graduates below. Choosing a well-suited program that teaches the area-specific information needed to excel in the field is often the first step toward beginning an online master’s degree in marketing. However, it can be overwhelming to sift through all of the schools that offer online marketing master’s degree. Using the list of top-rated schools below can help prospective students narrow down their options when looking for a potential program based on factors like number of programs available, student-to-teacher ratios and tuition costs. See which schools made the cut for 2017 below. Because the master's degree program in integrated marketing communications at Northwestern University is part of the School of Journalism and Media, adults majoring in the marketing can gain journalism, reporting and traditional and emerging media skills. Students are accepted from around the world. Analytical and communications skills as well as strong academic performance can help adults get admitted into the program. There is a full-time and a part-time master's program. Full-time students participate in a 10-week immersion project. Marketing analytics, brand strategy, content marketing, media strategy and digital marketing are study categories in both the full-time and part-time designs. Webster University’s Master of Marketing degree teaches students effective marketing practices and procedures and allows them to gain the analytical ability to make strong decisions in relation to marketing. Students will learn principles, terminology and theories related to successful marketing. Students will also be able to synthesize these ideas together. The program prepares students to make effective marketing plans. Topics covered include management, marketing research and digital marketing. Students are prepared to enter the workforce with an upper-level course focusing on career success in the 21st century. Students can also choose electives to specialize their education. The Stuart School of Business administers the Master of Science in Marketing Analytics degree at the Illinois Institute of Technology. To ensure that the classes align with current marketing needs, the institute created the Marketing Analytics Advisory Council. At a glance, the program consist of eight core classes and three electives. These classes combine for 36 credit hours and teach adults about subjects like marketing research and engineering, spreadsheet modeling and business analytics for competitive advantage. The school allows part-time students to take as few as one course a semester. Concordia University-Wisconsin offers an online marketing MBA. The program is geared for students who are already in sales, advertising and similar businesses who are looking for career advancement. The school prides itself on one-on-one instruction from instructors who know how to personalize an education. Students will gain an understanding in direct, social and international marketing. The courses are taught by industry professionals with years of real-world experience. Students will learn the skills necessary to succeed in modern competitive business environments. The school is a religious organization, so it emphasizes using a Christian framework in professional settings. Online courses are offered on a convenient schedule and still allow students access to top-rated faculty. South Dakota State University's Master of Mass Communication degree is an advanced academic program geared toward adults who are interested in communications, marketing or public relations careers. Although communications theory is presented during the coursework, professional application is the primary focus of the instruction. Students learn about important policies and events such as freedom of speech, the process of organizing petitions, marketing ethics and numerical statistics. Independent and critical thinking are strongly encouraged. If students engage in research and design, they could graduate after completing 32 credits. Should students only complete coursework, they will need 36 credits to graduate. The Master of Art in Advertising degree curriculum at Savannah College of Art and Design is taught at the college's Atlanta, Georgia, Savannah, Georgia and Hong Kong campuses. Upon request, students can also earn the degree completely online. In addition to learning how to create and layout advertising designs, students gain copywriting, headline development, branding and innovative advertising skills. About 45 credit hours are built into the curriculum. Students get the chance to develop real life ads before they graduate. Some of the ads are picked up by major corporations. West Virginia University’s Master of Science in Integrated Marketing Communications has a focus on the latest communication techniques for marketing professionals, as the name suggests. The master’s program consists of various courses, which help students gain a broad understanding of marketing within a greater organizational framework, instead of separate roles like public relations. The school emphasizes a practical, customizable experience. The program is offered online so working students can learn at their pace. The curriculum is built so students can learn key ideas and apply them on the job the very next day. Marketing professionals receive a master's level education through the University of Saint Mary's Master of Business Administration degree. Marketing and advertising management is the concentration through which marketing majors advance their training. Advertising in the 21st century, marketing research, buyer behavior and advanced marketing strategy and planning are defined areas covered within the concentration. Marketing classes are also taught within the general management specialization. By combining marketing, finance and business management learning, graduates could fill organizational supervisory or marketing leadership needs. The broad study areas could also open pathways to more general business leadership roles. Pace University New York offers adults the opportunity to gain credentials to work in marketing management. Training to potentially start supporting organizations at senior marketing levels is acquired through the Marketing Management Master of Business Administration. The Master of Science in Marketing is the other degree that spotlights branding, buying and selling. Students are expected to have a basic understanding of marketing methods, strategies and analytics. During the master's program, faculty teach students how to use media, digital marketing tools and customer intelligence to build customized marketing programs. All classes are held at the New York campus. Saint Joseph University awards a Master of Science in International Marketing. Curriculum associated with the degree provides marketing majors skills to build brands for domestic companies and for organizations that have a global impact. The chance to learn firsthand about diverse cultures is derived while completing an international study tour. Classes graduate marketing majors can expect to take include international marketing research, global marketing communications, international channel management and international product development and brand management. Schedule for classes is on a semester basis, with each semester running for 14 weeks. Aside from factors like tuition costs and student-to-teacher ratios, prospective online master's in marketing students may need to consider other elements when finding a program. The search tool below can help students filter programs based on several different criteria like acceptance rates and school size. The online master's degree in marketing timeline is designed to help students understand what they can expect during the application process and each year of study. Although the time required for an individual to complete his or her degree may vary, a master's degree in most cases will require two years to complete. See an example of what to expect for a two-year, full-time track timeline and standard application process below. Admission into an online master’s in marketing program can be competitive. Some schools have quite rigorous and extensive admissions expectations, requiring more components than just a standard application and transcript. Below are some examples of what aspiring students might encounter. Though the bachelor’s degree is typically a requirement when enrolling in a master’s program, most schools may not require the bachelor’s degree to be in marketing or a related field. However, some undergraduate business-oriented classes may be required, such as accounting, quantitative analysis, introduction to marketing, and organizational theory and behavior. Accepted students without a business or marketing background will often need to take these courses during the first year of their master’s program. A prospective student’s undergraduate GPA can be an important component of an application. Most schools may have a minimum GPA requirement for admission. Please review your desired program’s GPA requirements for more information. Many schools offering an online master’s degree in marketing will require applicants to have a GRE or GMAT test score. Some schools will accept scores from either test as long as the scores are no older than five years. Letters of recommendation should typically be written by colleagues, former professors and other individuals who can speak to the student’s marketing work. Some schools will allow the student to turn in the letters with the admissions packet, while other schools simply require contact information so they can request the letters on the student’s behalf. Most online master’s in marketing programs do not require applicants to have work experience in marketing or similar field. However, having this experience may improve the chances for admissions. Admissions officers tend to like students who are well-rounded with a wide array of experiences in their chosen field. A personal statement generally gives the applicant an opportunity to share more about themselves and why they would be a great addition to a particular school’s incoming marketing class. Many online master’s degree in marketing curriculums require core classes that all students must take. Many of these classes focus on topics like strategic planning and leadership within the marketing realm. The major learning objectives students may expect to complete during their first year are listed below. Many online master’s degree in marketing programs will focus their curriculum on “big picture” ideas and concepts. For example, students may learn how to tweak a particular marketing campaign so it achieves the overall goals of a company. These courses are generally only necessary for those entering an online master’s in marketing program with little to no relevant academic or professional experience. For these students, entry level business and marketing classes usually will be completed during this first year. In addition to learning how to think strategically, students will often acquire leadership and management skills. For example, once a marketing plan has been developed, it must be put into action, so master’s in marketing students typically will learn how to effectively communicate and oversee their subordinates in order to effectively implement strategic plans. Besides helping to develop big picture thinking and management skills, a master’s degree in marketing will often provide an opportunity for students to enhance their skillsets in unique areas and concentrations. Many of the courses offered in an online master’s level curriculum may cover advanced and recent developments, such as business analytics, big data and digital marketing. Many online master’s degree in marketing programs will allow students to take certain marketing electives. This may provide an opportunity for students to tailor their education to their needs for professional development. If not already required in order to graduate, students may have the opportunity to apply for internships where they can take what they have learned in school and use it in an actual business setting. Alternatively, those students who are already working in the marketing field may use their new skills to make immediate changes in their work performance. Most online master’s in marketing degrees generally take about two years to complete and consist of about 30 to 50 credits. In addition to taking and passing the required courses, students may also be need to complete additional requirements for graduation. Below are some examples of common graduation requirements. Most programs may require courses to be completed with a minimum grade in order to receive course credit that can be applied toward the requirements needed to graduate. Many programs may also require a minimum overall GPA in order to receive an online master’s in marketing degree. Depending on the school, an internship or practicum may be required or strongly recommended for graduation. Internships or practicums may be especially important for students who do not already have real-world experience in marketing or business as it can provide an opportunity for students to strengthen their newly developed marketing skillset. In addition to completing coursework, most schools may require a master’s thesis. This often requires in-depth research on a unique topic in the marketing world as well as a written report that details what the student has learned and the conclusions reached. Many online master’s degree programs may require a capstone project where students will apply what they learned to a comprehensive marketing plan. Students will typically need to work on this marketing plan from conception to execution with financial justifications provided along the way. This might be required in addition to the thesis. For some, a master's in marketing degree is the next step to toward a promotion or pay raise. For others, it may be the start of a whole new career. Below are some popular career paths in the marketing that are available for those with a master's degree. Public relations managers often oversee strategic plans that are intended to improve the image of their employer or customer. Job tasks may include approving press releases, identifying potential clients, developing public relations campaigns and creating plans for communicating with various media contacts through several different channels. Creative directors typically identify, develop and implement the overarching message or campaign for a business. Specific tasks will vary depending on the organization, but typical duties include overseeing the creative process to ensure it's in line with given directives, communicating with clients to help develop a creative campaign and approving designs developed by others. Under the direction and collaboration with other top executives like a CEO, a chief marketing officer (CMO) generally works to design an organization's marketing efforts. In order to accomplish this strategic goal, CMOs assign individuals to particular marketing roles, help devise a marketing plan in accordance with the directors of the chief executive officer and/or board of directors, and approve marketing related decisions. Graduates of an online master's in marketing program will typically learn not only the underlying concepts of how market data can be gathered and analyzed on a large scale, but also how it can be used to improve an organization's ability to reach and connect with its current and potential customers. Whether through traditional methods like taking a client out to a meal or through modern methods like data mining customer data and order history, some of the most important skills a student can acquire will be how to keep and find new customers. After finishing their studies, graduates will often have the tools to understand and build customer relationships. One way for companies to find new customers is to expand into untapped markets, including those on the international level. Most, if not all, online master's programs in marketing will provide an opportunity for students to learn how to market abroad by learning what customers want and how to take into account cultural considerations. Some courses may be more specific and teach students how to market in regions or countries, such as Latin America and China. This association is a premiere professional association for marketers in both academia and the business world. They establish a statement of ethics, sponsor training and promote career advancement. This group works to advance students in various academic fields, such as finance, marketing and hospitality. DECA sponsors educational programs, scholarships and events for college students. This association is one of the largest membership organizations for marketers and related fields. This international organization strives to foster information sharing to help those in the marketing industry. SEMPO is an international, non-profit organization with the specific focus on helping the search engine marketing industry. SEMPO looks to advance the industry by sponsoring research, fostering networking and providing educational opportunities.